Brads come in many different colours, shapes, sizes and finishes. 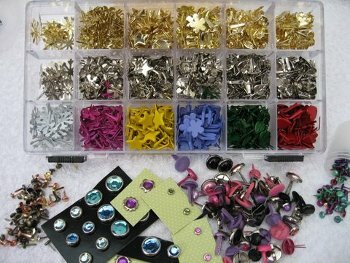 There are jewels, glitter and velvet, Gold, silver, bronze, pink, blue in fact any colour you require. You can buy these useful additions big, small and even huge ones if that is what you fancy. Some have words on them, or symbols. Others have pictures or characters on them to suit your theme. 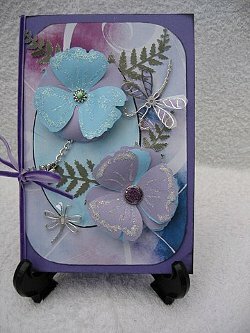 They can be used just as decoration by themselves, or to attach acetate and parchment to your card. They are very versatile. 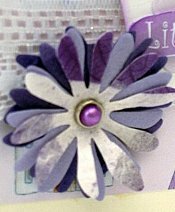 Use them to attach ribbons or tags, or when building up flowers and you need something to pop in the centre. This is a flower made from felt, with a pearl in the centre to hold all the layers together. You could also use them to attach small charms to your cards. Buy them in small packets or big tubs and use them for effect wherever you need them. They aren't expensive and will go a long way. They come in Antique Gold or pewter, and there are various shapes and sizes in one pack. You simply punch out some of the paper you are using and fix it via the enclosed glue sticker to the coloured base of your choice. Then cover the top with one of the glazed dome covers. There are three different sized punches too so you will always have the perfect embellishment to co-ordinate with your project. 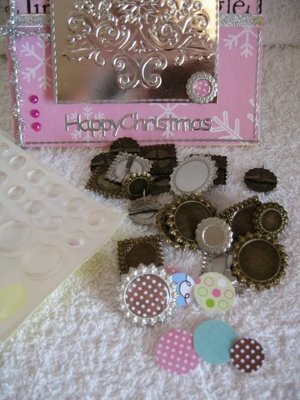 And this is a good way to use up any of those scraps that you can't bear to part with.